The Digital Multimeter Series TRMS METRAHIT ENERGY is a very versatile instrument for measuring energy and power. Due to the increase of the energy prices, this digital multimeter is very useful. In addition to measuring the active power and energy, it also detects the apparent and reactive power. The Digital Multimeter Series TRMS METRAHIT ENERGY also allows an analysis of the network quality. The maximum and minimum values of voltage are recorded with date, time and duration. The voltage peaks over 1 ms are recorded in the digital multimeter. The digital multimeter offers, due to its integrated FFT, harmonic analysis up to 15 harmonics. To ensure a comfortable performance and use, the digital multimeter is equipped with a triple screen. This allows the Digital Multimeter Series TRMS METRAHIT ENERGY to display several measurements values or measurement values with date and time. The automatic locking of terminals and automatic range selection make the digital multimeter work quickly and safely. This is especially good for new users. Users can also adjust the measurement range of the digital multimeter. The variety of the digital multimeter functions is complete with an internal memory function. Depending on configuration, this meter can store up to 300,000 measurement values. The optional software for the digital multimeter is to analyse and document the measurement values. The DKD calibration certificate certifies the accuracy of the Digital Multimeter METRAHIT ENERGY. 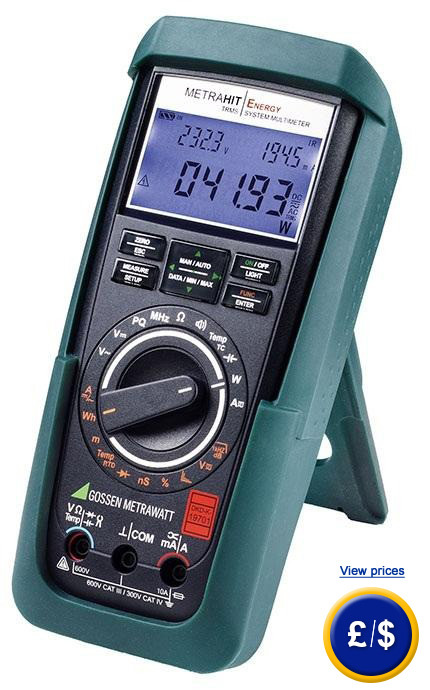 To view similar equipment for different applications, click on multimeters. If you have questions about the digital multimeter, see the technical data below or contact us. Our technicians and engineers will be happy to advise you on the digital multimeter and any other product of our regulation and control systems, meters or scales. relative humidity: 40 ... 75 % H.r. 1 x Digital Multimeter ENERGY METRAHIT, 3 x sets of cables, 1 x protective rubber case, batteries, DKD calibration certificate, 1 x Quick Guide, 1 x CD-ROM and user manual. Optionally, you can order a hard case to use the digital multimeter ENERGY METRAHIT on site. This hard plastic case offers enough space to store the digital multimeter with all accessories. In addition to convenient transportation, it provides protection against mechanical damage. This way the digital multimeter can be used for external services.